How to create dynamic web environments using the PHP language and the MySQL database! If you are familiar with the syntax for C, C++ and Java, then PHP will seem very familiar. Once you have got up to speed with this HTML embedded scripting language, you will soon be creating dynamic HTML database-enabled web pages quickly and easily. This quick and practical introduction explains: - how PHP works and what a dynamic web page is - the software development environment - the syntax and features of the language - how PHP can be integrated with MySQL databases - dynamic database applications. 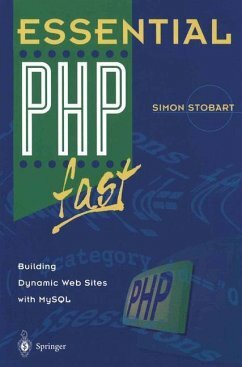 Clearly written, this book provides you with all the essential information you need to create your own dynamic web environments using PHP. 1. 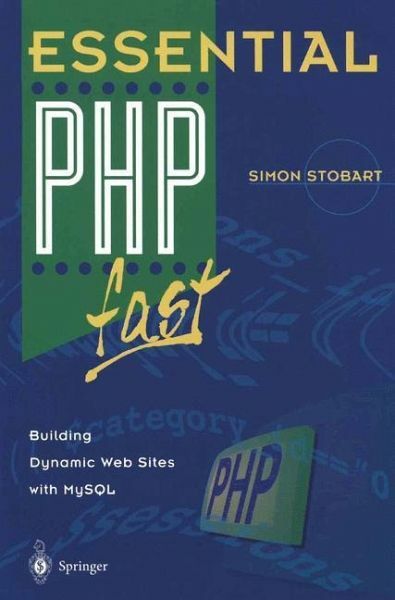 Introduction.- Why PHP and MySQL?.- Is this Book for You?.- How to Use this Book.- 2. Creating a Typical PHP Development Environment.- WebBrowser.- Webserver.- PHP.- Text Editor.- Database.- Summary.- 3. Introducing PHP.- A Simple HTML Document.- First PHP Script.- The History of PHP.- Static and Dynamic Web Pages.- How Is PHP Different?.- Formatting PHP Instructions.- Jumping In and Out of PHP.- Echo and Print Statements.- Comment Statements.- Summary.- 4. Variables: Integer and Floating-Point Datatypes.- What Is a Variable?.- Assigning a Variable by Value.- Assigning a Variable by Reference.- Different Types of Variables.- Integers.- Floating-Point Numbers.- Summary.- 5. Variables: Strings.- Single Quoted Strings.- Double Quoted Strings.- Variables in Strings.- Joining Strings.- Referencing Characters in a String.- String Length.- Converting Strings.- Summary.- 6. Accessing Environment and PHP Variables.- Predefined Variables.- Environment Variables.- PHP Variables.- Summary.- 7. Investigating Expressions, Operands and Operators.- Expressions.- Operators.- Operands.- Arithmetic Operators.- The Assignment Operator.- Bit Manipulation Operators.- Comparison Operators.- The Conditional Operator.- Increment and Decrement operators.- Logical Operators.- Operator Precedence.- Summary.- 8. Controlling the Flow of Control.- Sequence, Selection and Iteration.- The if Statement.- The else Statement.- The elseif Statement.- The while Loop.- The do while Loop.- The for Loop.- Nested Loops.- Breaking Out of Loops.- The continue Statement.- The switch Statement.- Summary.- 9. Interacting with the User.- PHP and Forms.- Simple Form Processing.- GET and POST Methods.- Combining PHP and Forms.- Retaining Form Field Data.- Interacting with a PHP Application.- Summary.- 10. Arrays.- Single-Dimensional Arrays.- Multi-Dimensional Arrays.- Arrays and the foreach Loop.- Strings and Arrays.- Combination Arrays.- Manipulating Arrays at Run Time.- Summary.- 11. The MySQL Database Management System.- What Is MySQL?.- Starting the Database.- Creating a Database.- Dropping a Database.- Hiding the WinMySQLadmin Application.- Creating Database Tables.- Selecting a MySQL Database.- Creating Database Tables from a Dump File.- Dropping MySQL Databases and Tables.- Quitting MySQL.- Summary.- 12. Accessing MySQL Databases Using Php.- A Simple PHP Script to Display Database Records.- Accessing Multiple Records by Record Number.- Accessing Multiple Records by Column Name.- Checking for the Existence of Records.- Searching for Specific Records.- Using HyperLinks to Select Records.- Using a Form to Select Records.- Using a Form to Search on Different Fields.- Adding Records.- Deleting Records.- Updating Records.- Summary.- 13. Implementing Functions.- Advantages of Functions.- A Simple Function.- More Power to Functions: Using Arguments.- Functions with Multiple Parameters.- Functions and Local Variables.- Arguments Passed by Value.- Arguments Passed by Reference.- Default Argument Values.- Returning a Value from a Function.- Function Calls Within Functions.- Summary.- 14. Cookies.- Limitations of Cookies.- Setting a Cookie.- Viewing a Cookie.- Deleting a Cookie.- Using Cookies to Personalize Pages.- Summary.- 15. File Handling.- Opening a File.- Closing a File.- Reading Characters from a File.- The End of File Function.- Reading Lines from a File.- Reading a Remote File.- Writing to a File.- Summary.- 16. Classes and Objects.- A Simple Class.- Accessing an Object's Variables.- Multiple Objects of a Class.- Constructors.- Arrays of Objects.- Objects in Objects.- Inheritance.- Summary.- 17. Further Information Resources.- The PHP Manual.- The PHP Online Manual and FAQ.- The MySQL Manual.- The MySQL Online Manual and FAQ.- Other Online Resources.- And Finally.